My parents visit me every year during tax season, and their visit throws me into a spring cleaning tizzy. Last year when they were here, I woke up and found my mother cleaning my already-spotless bathroom floor. So this week I spent a few days deep cleaning for their visit -- floor scrubbing, sweater folding, window washing type cleaning. Household cleaning is a gazillion dollar industry. Just go to a store and look at the tremendous amount of real estate allotted to cleaning products - they promise to bomb germs and grime to kingdom come. You probably have an extensive selection of cleaners. Do we really need that many? We probably need fewer than we think. My philosophy of avoiding chemicals in my food and personal products whenever possible is pretty much the same with cleaners. This stuff can be toxic - take one whiff and let your eyes water. Cleaners work their way into your body through multiple channels - you inhale them as you are scrubbing, you absorb them through touch (even if its just walking into your recently Tilexed bathtub), and you eat them when you put food on your recently sprayed counter or just on your plates. You also drink them as cleaners get absorbed into the ground and contaminate our water sources. Have cleaners been proven to be toxic? Some of them have, but I don't really care. There is a strong dose of unpronounceable chemicals in those bottles, and I'm not going to wait around for a medical study to tell me that a specific cleaner is linked to a chronic condition. This stuff is clearly not good for my health or the environment. I started looking for less-toxic, greener alternatives a few years ago. It's hard! You can whip up your own natural cleaners with lemons, vinegar, baking soda and water, which is pretty cool, but I'm too lazy to do that, so I buy commercial items. It's pricier than making my own, but at least the "natural" alternatives leave a fresh, nice smelling house instead of a light head like the conventional stuff. I even look forward to using it - it's the only nice thing about cleaning. Simplify your cleaning needs in zones (in bold below), and begin greening your supplies gradually or all at once. There's an ever-growing world of green cleaners out there - from the granddaddies of green brands like Seventh Generation, Ecover and Biokleen to higher end Caldrea to the widely distributed Method. Check out your household products at this National Institute of Health database. Do you really need all those supplies? See if you can narrow what you need down to an all-purpose cleaner and a few specialists. Read the ingredients lists of your cleaners. Like food, make sure the lists aren't long and/or toxic sounding. If you are motivated to make your own cleaners from household ingredients, you are awesome. Search the internet for recipes or check out these by Real Simple magazine. Experiment to see what works best. Then share your results with us! I like products that don't require a lot of elbow grease. The easiest way to avoid heavy scrubbing is to clean regularly. When Silda Wall Spitzer was in the governor's mansion, they tried a lot of green cleaners and ended up primarily using Ecover, Seventh Generation and Biokleen. Buy large quantities of cleaner to refill your smaller bottles with. It's easier on your wallet and the environment! Most of the green cleaners make large refill sizes. Glass. Glass cleaner is actually easy and cheap to make. Real Simple says to mix ¼ cup vinegar, 2 cups water, and a squirt of liquid Castile soap in a spray bottle, then spritz windows and wipe with a sheet of newspaper. The now defunct Domino Magazine recommended Biokleen Glass Cleaner in 2008. Floors. I use Mrs. Meyer's All-Purpose Lavender Cleaner for non-wood floors. According to Real Simple, you can mop almost any type of floor with a solution of ¼ cup liquid Castile soap and 2 gallons warm water. If the floors are greasy, add ¼ cup distilled white vinegar to the bucket. Bathrooms. I use Mrs. Meyer's All-Purpose Lavender Cleaner ($7.99 for large 32 oz that can be cut into spray bottles) on everything in the bathroom. Domino Magazine crowned Solay Simple (7.95 for large 32 oz) their 2008 Green winner, and I'm planning on trying it. I have to admit, I don't always clean my bathtub as regularly as I should, and as a result, I had to bomb it with Tilex Mold and Mildew Remover for my parents. That stuff works wonders, but it smells like you need a hazmat. I'm going to stick to using my all-purpose more frequently from now on. Kitchens. I use the all-purpose cleaner for all surfaces in here as well. Some people want a disinfectant, which used to be hard to find green, but fortunately Seventh Generation has a new line of EPA registered disinfectants. Conventional dishwashing detergents are icky. Mine is from Williams Sonoma (works great on grease - I use it to clean off my stovetop when it's greasy), and I love my Biokleen Automatic Dish Powder. It's effective and concentrated so you don't need that much. One of the most common cleaning mistakes is using too much cleaner in the dishwasher, so be careful! Laundry. Domino Magazine crowned Shaklee "Get Clean Fresh Laundry" their 2008 Green winner. I haven't tried it but it's on my list. This is the other most common cleaning mistake - too much laundry detergent, so go light. It's good for your clothes and the environment. Wood furniture. My furniture store recommended Guardsman Furniture Polish, but I have a feeling it's not too green since it doesn't list the ingredients. Domino Magazine put Timothy Corrigan Home ($12.50 for 12 oz.) on their list. 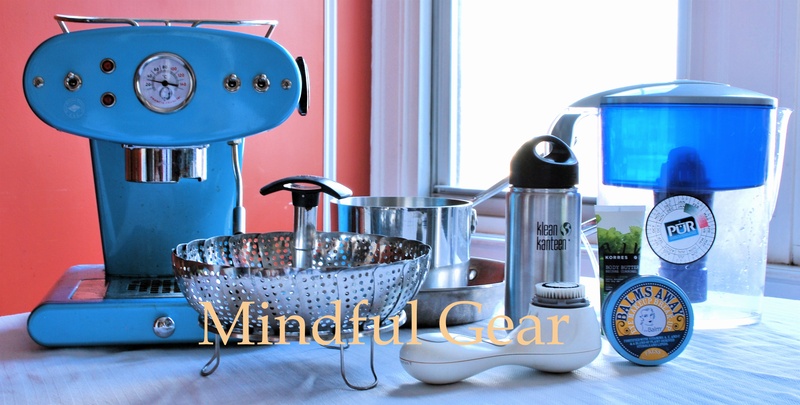 Mindful Gear - you can buy many green cleaners from our Amazon store if you can't find it locally. They can also make a nice present for an eco-minded person that has everything. Is Soy/Tofu Good or Bad for You? You may not know this, but soy foods are controversial. Some people think tofu is abominable because of the way it tastes, but if you look around on the internet, there are sources that think it is evil and "life-endangering". I had to investigate since I love tofu and don't want to endanger my life. After all, I gave up Cheetos and processed foods (which I love much more than tofu) because they're unhealthy. There's no way I'm going to endanger my life over tofu. Soy foods are considered good protein and calcium sources, so a lot of vegetarians and lactose-intolerant people turn to them for those nutrients. For a 3.5 oz serving (same size as a serving of meat), the organic tofu in my fridge provides 5 gm fat (7.5% DV or daily recommended value on a 2000 calorie diet), 10 gm protein (18.75% DV), 2.5 gm total carbohydrates (1.25% DV), 7.5% DV of calcium, 7.5% of DV iron, and 100 calories. Weston A. Price and Dr. Mercola are main proponents of the soy is evil thinking. The studies above and Dr. Weil make these people seem wacko. What to believe? I looked deep inside myself (not usually a source of answers), but I found some in my genetics. I am Taiwanese, and my people have been eating tofu, soy milk, and miso for centuries. Asians eat very little soy products (7 grams a day), and if so, it is always fermented. Have any of these people lived in an Asian home? Do they know any Asians? I happen to know a lot of Asians that I'm related to, but I know even more than that of all types. Soy products are pounded on a regular basis. Bowls of hot soy milk are served for breakfast in Taiwan. Koreans have stews that are tofu stews. No one I know has a tiny 7 grams a sitting. This is bogus. Phytoestrogens will lower sperm count and feminize boys. And 100 gms of soy protein have the equivalent of one contraceptive pill. Last time I checked, Asia was being accused of overpopulation - China even enacted a one child rule. There doesn't seem to be any low sperm count there. I don't think a feminized male could have kids. And I dare you to use soy protein as a contraceptive (not really, that would just be stupid). If soy was superfeminizing, you would think that the average Asian women would have the figure of Pamela Anderson Lee (post-surgery). Riiiight. There are more real hormones fed to industrial cattle than the tiny amount of plant hormones in soy. Soy causes Alzheimers and dementia, and causes you to die earlier. After centuries of eating lots of soy, there is no evidence of any of those things in Asia, and the population with the highest longevity is the Japanese. So, after filtering the evidence through common sense and empirical evidence, MindfulEats will confidently say soy (femented or not) is good for you as long as you're not allergic to it or have a thyroid disorder. Some people should avoid soy. If you have a soy allergy, a thyroid disorder, iodine deficiency (very rare) or hate the taste, then avoid it. If your body doesn't react well to it, avoid it. In terms of taste, I love tofu and can't abide the taste of soy milk. My brother likes soy milk but can't stand tofu. Buy only organic and non-genetically modified (GMO) soy products. Actually, a food that is certified organic is not supposed to be GMO so you're getting both. Soy is a large industrial crop that is heavily treated, which is why you want organic. Soy products (except for edamame) are processed foods. So you may want to go light on them. The anti-soy contingent is generally ok with fermented soy foods like tempeh and miso, but they're wacky. Use soy as a protein source, but like everything else, make sure you not eating it to the exclusion of other foods. Eat a WIDE variety of whole foods to get a full range of nutrition. For posts on SOLE food (sustainable, organic, local and ethical), go to Food Renegade. Our friend Dave passed along a great article on foods to avoid that was on msn.com. This was superhelpful because 1) no one reads msn, and 2) the article is really interesting. It's so interesting, we're going to summarize it. Farmed Salmon. MindfulEats has railed against farmed salmon. It's bad for you and the environment. Fishery expert, David Carpenter, M.D., director of the Institute for Health and the Environment at the University at Albany won't eat it. He published a major study in the journal Science on contamination in fish. Like land-based industrial farming, farmed fish are crammed into pens and fed odd things, so they are weaker than their wild brethren. They are loaded with antibiotics and contaminants, and like beef, they have less nutrition. Pound for pound, you are getting less nutritional value with farmed salmon. Switch to wild alaskan salmon. According to Carpenter, the most contaminated fish is from Northern Europe. Any fresh Atlantic salmon is farmed. Learn more about why seafood is controversial. Corn-fed beef. Farmer and writer Joel Salatin steers clear of anything but grass-fed beef. Industrial farmers raise their cattle on corn and soybeans since it fattens them up quicker for a fast profit. That meat is not as nutritious as naturally raised, grass-fed beef. You'd have to eat more of it to get the same value, and who wants to be fat? Not you. A recent study conducted by the USDA and Clemson University found that grass-fed beef is higher in beta-carotene, vitamin E, omega-3s, conjugated linoleic acid (CLA), calcium, magnesium and potassium; lower in inflammatory omega-6s; and lower in saturated fats that have been linked to heart disease. Pound for pound, you're getting more value with the grass-fed beef. Milk produced with hormones. Cancer researcher Rick North won't drink it. The former CEO of the Oregon division of the American Cancer Society notes that recombinant bovine growth hormone (rBGH or rBST) increases udder infections and even pus in the milk. It also leads to higher levels of a hormone called insulin-like growth factor in milk. Life is hard enough when you're hormonal - why drink it? If you can afford grass-fed milk, opt for it. Like meat, milk is better from happier, heathier cows. Canned tomatoes. Endocrinologist Fredrick Vom Saal, Ph.D., at the University of Missouri studies bisphenol-A (BPA) and he won't go near canned tomatoes. Cans are often lined with resin that contains BPA, and acidity (which tomatoes are) causes the BPA to leach. You can find tomatoes packed in glass or tetrapaks. These brands include Bionature, Coluccio, Trader Joe's and Pomi. Microwave popcorn. Toxoligist Olga Naidenko, Ph.D., a senior scientist for the Environmental Working Group avoids microwave popcorn since chemicals in the lining of the bag, especially perfluorooctanoic acid, are linked to infertility. Microwaving causes the chemicals to vaporize and migrate into your popcorn. "They stay in your body for years and accumulate there," says Naidenko. Yuck. Popcorn flavoring is also associated with lung disease (known as popcorn workers lung) for workers of microwave popcorn factories. Pop your own popcorn the old fashioned way - in a skillet. It's really cheap! Nonorganic potatoes. Jeffrey Moyer, the chair of the Organic Standards Board, won't eat non-organic potatoes. Apparently, root vegetables absorb all the chemicals (pesticides, fertilizer, fungicides, etc) in soil (yikes, I guess that means the other root vegetables are better organic too). Then on top of that, potatoes get sprayed with extra chemicals while growing, during harvesting and after they've been dug up. Moyer says "I've talked with potato growers who say point-blank they would never eat the potatoes they sell. They have separate plots where they grow potatoes for themselves without all the chemicals." Conventional apples. We all know that apples are one of the Dirty Dozen. Mark Kastel, a former executive for agribusiness, currently codirector of the Cornucopia Institute, won't eat nonorganic apples. Apples have lower resistance to pests, so they are doused regularly. If you can't buy organic, wash and peel your apples. The original article we cribbed this from is awesome, so read it here. MindfulEats is celebrating our first year anniversary, and we are very grateful to have you with us. We were founded last January during a particularly inspirational time - New Year Resolutions were swirling, Obama had just been inaugurated and the Steelers were on the way to the Super Bowl. It was also the middle of winter, and food choices were more limited than during the summer. Root vegetables dominated over fruit. If you haven't noticed a difference, you probably live in a warm and sunny area. Those of us in cold, wintry climates are fortunate that we can take advantage of delicious seasonal specialties. The interest in local foods seem to be increasing (yay!) and we've recently fielded several questions on what's in season - so Bill, Jon and Kaitlyn, this post is for you. Food that makes sense. It's cold out there, and filling your tummy with roasted sweet potatoes and a heart-warming stew or cassoulet makes more sense than eating a tomato and mozzarella sandwich with strawberries. You'll be in sync with nature! Cheaper and tastier food. Produce that's in season and local tastes better. Parsnips and turnips in the NYC greenmarket are $1 a pound. That's a lot less than the small bundles of spinach from California. Bundle up and go to the farmer's market. The selection is more sparse than during the summer, but you'll quickly see what's in season and you'll be able to buy the freshest. Besides, this is when your local farmers need the most support. They get a lot less traffic and they're cold too. Use this great site from Natural Resources Defense Council and check out what's in season. Learn how to cook root vegetables and meat. Most any winter food can be roasted or turned into stew. Your slow cooker is perfect for this season, and we roast veggies at least once a week. If you're in the NYC or SF area, buy this clever and beautifully illustrated Local Foods Wheel from Chelsea Green to always see what's in season. It makes a great gift too! It was our favorite item in a gift bag. What is Conventionally-Grown, Industrial Food? Grocery shopping in Aleppo, Syria. If MindfulEats were to draw a bright line in the world of food, the first and most important cut would be between processed and non-processed foods. Eating non-processed food is the best thing you can do for you and those you love. But you already knew that. The second cut would be within the non-processed food world, between 1) conventional, industrially grown food and 2) locally, sustainably grown food. Conventional, industrially grown food is quickly becoming the villain in movies and popular press. But like processed food, the reason it came into being wasn't to be evil - the idea was to make farming more efficient to provide more and cheaper food for everyone. Not a bad idea. It's the actual production and execution that is the problem. To understand the issue, let's take a look at the way food has traditionally been grown. Food (plant and animal) is grown on land. Like you, land gets tired and less productive when it is worked hard and without rest (which is what farming does). Different plants take different nutrients from the soil, and leave different types of waste. The traditional farmer had to be smart about raising multiple types of crops so he didn't strip the soil of all nutrients, and leave himself with dead fields in a few years. He also had to rest plots of land so the soil could enrich itself. Likewise, he had to grow different animals to be efficient. Cows would graze on grass and poop in the fields. Chickens would peck through the poop for food, scattering the manure for more efficient fertilizer as they pecked. Pigs ate leftovers and rooted through fields, helping to aerate the soil and creating more poop for chickens to peck through. Farms were an ecosystem of their own, growing food for the farmer and a few others, and being carefully managed so the farm would exist for generations. Industrialization came along and decided traditional farms were inefficient. Like factories, industrialists thought they could increase production. Instead of planting different kinds of crops, they thought they'd just plant one type (corn, for example) on a large tract and be super efficient about it. They added chemical fertilizers to make the crops grow faster, and herbicides/insecticides to reduce pests. The problem is, the chemicals and just the one crop stripped the soil of its nutrients, so even more chemicals had to be added to make the same land grow as much. This creates a huge environmental problem with all the chemicals, and lots of people don't want to eat those chemicals. It's gross. Enter the growing demand for organic, unchemically grown food. Meat production went through the same process. Industrial farmers figured they could produce more meat if they raised mass amounts of one type of animal. So each farm focuses on one type - beef, pork, chicken, etc. To grow more meat, they jam as many animals as possible on a plot of land. This means the animals don't have room to exercise, stand around in lots of poop, and are prone to getting sick (that's what happens with poor quality food and lack of exercise). Since they are so close to each other, disease sweeps through quickly. Hello antibiotics. To counteract potential disease, 70% of the antibiotics produced in the U.S. is fed to animals, as stated by Congresswoman Louise Slaughter in her statement to the Agriculture Subcommittee. So when you eat industrial meat, you are eating sickly animals that are filled with artificial hormones and antibiotics so they will grow more quickly and not get diseased. All those drugs and waste leach into the environment and water supply, which causes a big environmental issue that will have to get cleaned up some day. Sure, cooking helps kill the additives, but that animal you're eating is pretty sickly and unhappy. Yuck. It's bad karma. Pigs are smarter than dogs, and those industrially grown pigs get so depressed they put antidepressants in their feed along with antibiotics. If you took two kids, and raised one so that he played outdoors and ate healthy food, he'd have a good shot at being happy and hale. If you forced the other kid to spend all his time in a closet eating nothing but cereal, you'd have a kid with lots of issues. That's industrial farming. your health - you and your family get lots more chemicals into your food, and you eat sickly depressed animals. It hasn't been proven to be harmful yet, but do you really want to wait for that proof? That's why people like farmer's markets - it provides a direct connection to food grown the traditional, sustainable way, as do responsible retailers and grocery stores. Buy organic and locally produced food if you have the means. You're getting a bigger bang for your buck than you are when you spend your moolah on designer clothes. Ask your restaurants about their food, and patronize the ones that buy responsibly. Share your philosophy with others. Watch the movie Food, Inc.
For articles on SOLE (sustainable, organic, local, ethical) food, go to Food Renegade.